The Hampton Inn Carlstadt-At The Meadowlands hotel is located minutes from Route 17 Route 3 and the New Jersey Turnpike and is adjacent to the Meadowlands Sports Complex. Our Carlstadt Hampton Inn is two miles from Teterboro Airport and ten miles from Newark International Airport. Attractions near our New Jersey hotel include Continental Airlines Arena Giants Stadium the Meadowlands Racetrack and Secaucus Outlet Center all just minutes from the hotel. New York City is 15 minutes and the Statue of Liberty is just 30 minutes away. Within one and half miles guests can dine at Charley Browns Romanissimo Ristorante Sonoma Grill Grasshopper or Redds Sports Bar. The hotel provides complimentary shuttle service within a 5 mile radius of the hotel. Our Carlstadt Hampton Inn is a AAA three diamond hotel and a Mobil three star hotel. The 121 amenity filled rooms include a coffeemaker hair dryer iron and ironing board refrigerator and 72 channel cable TV with pay-per-view movies. Guests can request a deluxe suite with a whirlpool connecting rooms cribs and microwaves. 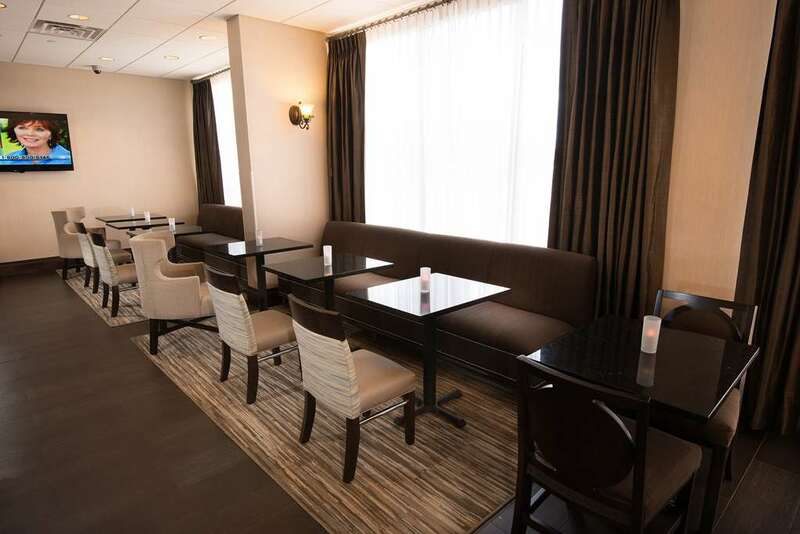 Sure to please the busy executive or leisure New Jersey traveler Carlstadt Hampton Inn hotel guests will enjoy complimentary On the House hot breakfast buffet served daily complimentary wireless high-speed internet throughout the property and a fitness center. A guest laundry facility and laundry/valet services are available for a nominal fee. We love having you here in New Jersey at the Carlstadt Hampton Inn-At the Meadowlands hotel.